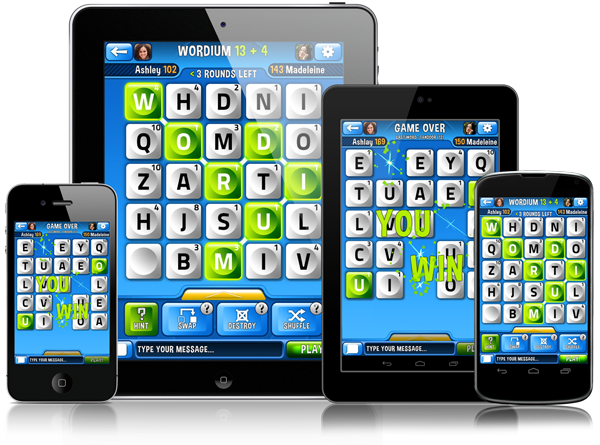 Wordium is a free-to-play asynchronous, turn-based word game where players take turns building the highest-scoring words using adjacent letter tiles. As players score a word, the used letter tiles disappear and new ones drop onto the board, resulting in a constantly moving, always surprising gameplay experience! Players compete for 10 rounds: high score wins! Wordium is available in the App Store and on Google Play worldwide in English. Additional languages coming soon. Follow us on Facebook and Twitter for the latest news and updates. Copyright 2013 Trebuchet Entertainment. Wordium™ is a registered trademark of Trebuchet Entertainment. All rights reserved. Apple, the Apple logo, iPad, iPhone, and iPod touch are trademarks of Apple Inc., registered in the U.S. and other countries. App Store is a service mark of Apple Inc. Android is a trademark of Google Inc. Device photo attributes.